with this one that promises a meaty base set, 50 Rated Rookies and plenty more. There will be three retail pack formats for this one standard box, blaster box and fat packs. with inserts that include Retro Series, All Clear for Takeoff, Swishful Thinking and The Champ Is Here. and Jersey Series Prime (/10). Court Kings Press Proof Orange (/99), Rookie Kings Press Proof Orange (/99) and Hall Kings Press Proof Orange (/99). and Press Proof Blue variations for all inserts (/125). and will likely post all-new First Buzz pieces for the hobby info once those arrive. Dernière modification par Eyeshield21 le 08 juin 2018, 11:19, modifié 8 fois. for even more cards featuring a very solid class that includes names like Markelle Fultz, Jayson Tatum, Josh Jackson, De’Aaron Fox, and Lonzo Ball. A modern product with a decidedly retro feel, Donruss is also an affordable product that puts some power into packs. and memorabilia at decent odds that make for a fun break for both established and novice collectors. it will include 50 Rated Rookie cards. to find a vast rainbow of parallels for each card as well. is just a brief glimpse of what is coming for player collectors. With each pack containing either a parallel or insert card, there is definitely some variety in 2017-18 Donruss. Many of the insert sets will be exclusive to certain configurations that include hobby and retail boxes, blasters, and jumbo packs. and the cleverly-named Swishful Thinking. It is likely that all of these cards will have multiple Press Proof parallels. Hobby boxes of 2017-18 Donruss have both an autograph card and a memorabilia card inside (on average). On the autograph side, look for Dominators and Rookie Dominators. There are 30 different freshman signers to track down. Some big names are on the Dominators checklist as well. with Panini spokesmen Kobe Bryant and Kyrie Irving. Elite Signatures is made up of 40 great players, each numbered to 40 or less. The parallel versions of these cards come in Gold (/10) and Black (one-of-one). One of the coolest collections coming in 2017-18 Donruss Basketball are the Next Day Autographs. Signed live at the 2017 NBA Rookie Photo Shoot, the cards were printed mere hours after their photos were taken. and that checklist is bound to have many of the top picks from the 2017 NBA Draft. The basic version is limited to 75 copies while the Prime edition is numbered out of 10. There will be three retail pack formats for this one — standard box, blaster box and jumbo packs. Signature Series Gold (/10) and Jersey Series Prime (/10). and Yellow, Laser Red and Blue (/15), and Press Proof Blue variations for all inserts (/125). Dernière modification par Eyeshield21 le 08 juin 2018, 11:22, modifié 2 fois. Next Day Autographs, Rookie Dominators Signatures, Rookie Materials Signatures and more. But rookies alone, no matter how hot, are just one part of the Donruss equation. with the Dominators Signatures insert featuring autographs from the likes of Kobe Bryant, Shaquille O’Neal and Larry Bird. each hobby box (10 cards per pack, 24 packs per box, 20 boxes per case) will deliver one autograph, one memorabilia card and 24 inserts. The highlights of 2017-18 Donruss are many and include . .
- Elite Signatures features a checklist of 40 players with every card sequentially numbered to 40 or less. - Every player also has a Gold version numbered to 10 and a Black 1/1 version. printed, returned overnight and autographed all within 24 hours. - The popular Next Day Autographs set is the result of that process. - The calling-card Rated Rookies represent some of the most collected Rookie Cards of the year. - This year’s edition includes 50 rookies form the 2017 NBA Draft class. - Rookie Materials Signatures includes memorabilia swatches and autographs from the top 2017 rookies. - Look for base versions numbered to 75 and Prime Memorabilia versions numbered to just 10. We’ll have much more on 2017-18 Donruss in the coming weeks right here on The Knight’s Lance. The Basics : There will be three retail pack formats for this one — standard box, blaster box and jumbo packs. Among the autographs will be Dominators Signatures for 40 players with all cards limited to no more than 40 copies. for 30 players and Next Day Autographs with images and autos from the annual rookie photo shoot (Fultz in gallery). There will be 50 Rated Rookies with a number of parallels including Black and Gold Press Proofs. Autographed memorabilia cards will include Rooie Materials Signatures (/75) with prime versions (/10). 2017-18 Donruss is a perfect representation of an affordable brand with an established presence. And, the hits are still an option, with one autograph and one relic per hobby box. Each hobby pack also includes two inserts, just like the 2016-17 Donruss NBA set. with Press Proof Black and Press Proof Gold. Press Proof Blue (#/25 - Gravity), Holo Purple Laser (#/15 - Blaster), and Holo Red and Blue Laser (#/15 - Fat Pack). Hall Kings, Rookie Kings, Retro Series, The Champ is Here, and The Rookies. There are also many exclusive insert parallels across the retail formats. and Rookie Dominator Signatures both include Gold and Black parallels. with a horizontal layout featuring an added relic piece and autograph. Prime versions are numbered to just 10 copies. and signed within 24 hours during the NBA Rookie Photo Shoot. returned to the Rookie Photo Shoot overnight, and signed - all within 24 hours! with the Rated Rookies set, featuring 50 rookies from the 2017 Draft Class. Kobe Bryant, Shaquille O'Neal and Larry Bird. from one of the top members of the 2017 NBA Draft Class. - Dominators Signatures – Features a checklist of 40 players with every card #’d/40 or less! - Rookie Dominators – Thirty of this year’s top rookies are looking to dominate the new autograph market! card files are sent to the printer, returned to the Rookie Photo Shoot overnight, and signed – all within 24 hours! Dernière modification par Eyeshield21 le 13 mars 2019, 12:10, modifié 5 fois. Dernière modification par Eyeshield21 le 08 juin 2018, 11:23, modifié 1 fois. 2017-18 Donruss Jersey Kings Set Checklist 25 cards. Dernière modification par Eyeshield21 le 27 nov. 2017, 11:41, modifié 4 fois. to showcase one of the most impressive rookie classes in many years. inclusions such as Rated Rookies, Press Proof parallels, Court Kings and more. 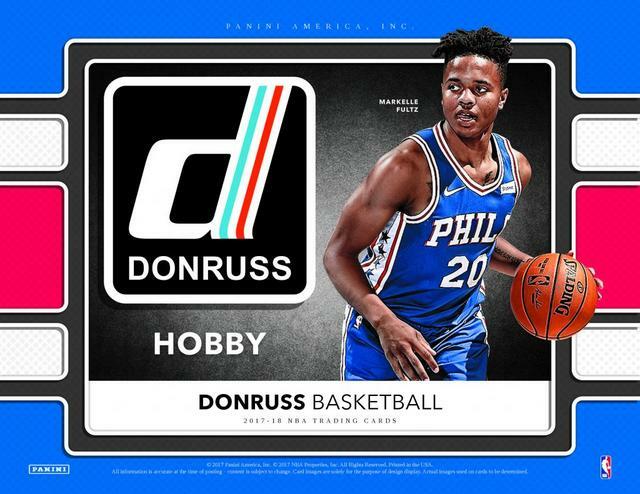 We brought you a comprehensive overview of this year’s Donruss Basketball with yesterday’s Quality Control Gallery. Today, we’re taking you directly to the box level with a pack-by-pack exploration of two early boxes. for novice and advanced enthusiasts alike. It’s as much a part of the NBA as the basketball itself. But 2017-18 is no normal NBA collecting season. and potential to make NBA and collecting history. and the pre-release excitement its generating in hobby shops and in retail outlets across North America. (it will follow in retail outlets in the coming weeks). Bolstered by venerable staples such as Rated Rookies, Press Proofs, Court Kings and more. with a showcase of just about everything the product has to offer. will deliver one autograph or memorabilia card and 24 inserts. and fat packs. Standard boxes ($2.49 per eight-card pack suggested retail price) will come in 20-box cases. of legends, rookies and veterans as well as a 10-card set focusing on the career of Kobe Bryant. Hobby Update : Hobby packs will carry a suggested retail price of $3 and there will be 24 inserts per box (one per pack). of the NBA champion Golden State Warriors and other teams. Special Delivery, Courtside and Team Leaders. Each of these sets will have Artist Proof (/25) and Gold (/10) parallels. Dernière modification par Eyeshield21 le 13 mars 2019, 12:11, modifié 2 fois. J'ai jamais compris pourquoi les next day auto se vendaient si cheres, la ntilikina est partie pour 230$ et je me souviens que la luwawu meme en fin de saison derniere partait dans les 30!